"On a shelf cluttered with the boastful and self-seeking, Doug lifts the blanket concealing the true game and reveals an insight and perspective unlike any other you will find. Penetrating and honest, Doug takes you into the genuine, unveiling what few have the privilege to experience. A book both umpires and players can agree on." "For anyone who loves to know what goes on behind-the-scenes in baseball, Doug's book is a front-row seat to all the action -- on the field, in the clubhouse, and the business side of the game." "Doug Glanville is as deep a thinker as any baseball player I've known. His insights about the game and the business are worth the attention of any baseball devotee." Orin Starn, Duke University, Head of the Anthropology Dept. "I found Doug Glanville's The Game From Where I Stand a wonderful teaching tool in my classes. Students love the book for its engaging mix of personal anecdotes and war stories from the big leagues. Yet The Game From Where I Stand also opens up for discussion much larger questions about money, race and gender, myth-making and celebrity, and the role of the athlete in our sports-obsessed culture. Students cited the book as a favorite reading of the semester, and I plan to use it again in the future." Read more about Orin Starn, Duke University, Head of the Anthropology Dept. 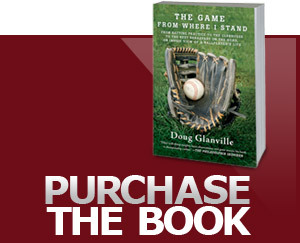 "The Game from Where I Stand is our must-read baseball book of 2010..... Glanville [offers] some of the most intelligent and insightful commentary on the game today!"